The best neighborhood craft show in Richmond! 2019 will be my 7th year in the business of art, and I’m starting it off by taking a month to travel in Argentina. 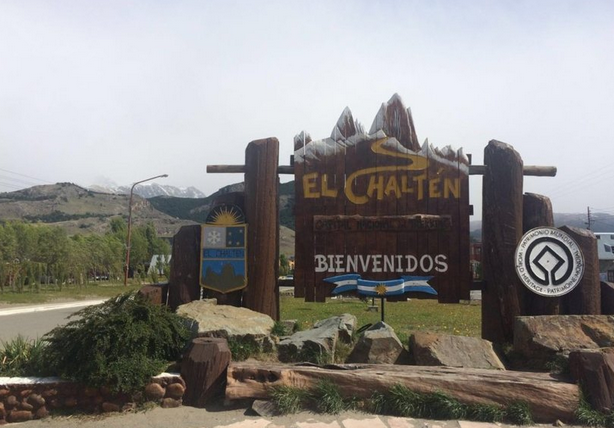 My friend and studio assistant Molly Sharp will be traveling with me, and we will go from Buenos Aires to Mendoza to Tupungato to Bariloche to Patagonia, with many points in between. I will post photos on social media as wifi is available, but my priority for this trip is to experience and immerse in a different culture, unplug from my various electronic devices, draw and design and think about where I want to focus my art in the coming months and years. Holiday CraftMorristown is celebrating its 28th year at the indoor Morristown National Guard Armory. Savvy shoppers have the chance to wow their loved ones with one-of-a-kind holiday gifts they will never forget. In addition to 165 craft artists from across the country are various demonstrations and a gourmet specialty food boutique. Now in its 54rd year, Craft + Design is a museum-quality show that has garnered national accolades and a reputation for showcasing the finest in contemporary crafts. Awards are presented in ceramics, contemporary design, fiber, glass, innovative use of traditional craft materials, precious metals, and wood and recycled materials. We also honor artists with the New Artist Award and the Best Booth Design Award. On the second weekend in November, artisans in Central Virginia open their doors for you to explore their working spaces. For 2018 we offer 28 studios showing the work of 49 Virginia artisans. What a great way to spend a fall weekend! It’s a fair like no other! Join us for our three-day celebration of all things handmade. 135 juried artisans from across the country gather in the National Landmark of Waterford, Virginia to exhibit and demonstrate jewelry, clothing, furniture, and home décor craft. It’s your chance to touch, feel, and explore high-quality American craft and meet the makers behind the fabulous work. For the month of October, I will be displaying a curated selection of my copper abstractions, candelabra, and hand-forged copper at the historic Crozet train depot in the heart of the town. Mark your calendars now and plan to meet the Artist at the Second Saturday Reception from 3 pm until 5 pm at the Depot. Road trip 2018 to Indianapolis with my good friend Molly! Of course, we will get a chance to visit with daughter Rachel and sample lots of the Indy vibe, and look forward to making new friends at the show. I'm in my same space, booth 15 on Talbot Street. Hope to see you there! Between 16th and 20th and between Delaware & Pennsylvania, in the historic Herron-Morton Neighborhood. Sunday, from noon - 5:00 p.m.
Support your favorite RVA copper wrangler and find a great selection of gifts for holiday giving! One day only, Saturday, Dec. 2 from 10am-5pm. I'll be in the auditorium! Now in its 53rd year, Craft + Design is a museum-quality show that has garnered national accolades and a reputation for showcasing the finest in contemporary crafts. Awards are presented in ceramics, contemporary design, fiber, glass, innovative use of traditional craft materials, precious metals, and wood and recycled materials. We also honor artists with the New Artist Award and the Best Booth Design Award. Last year’s Elisabeth Scott Bocock Best in Show Award went to glass artist Sean Donlon. Buy general admission tickets and tickets to Patrons' Preview and Rise + Shine. Or consider a weekend pass. 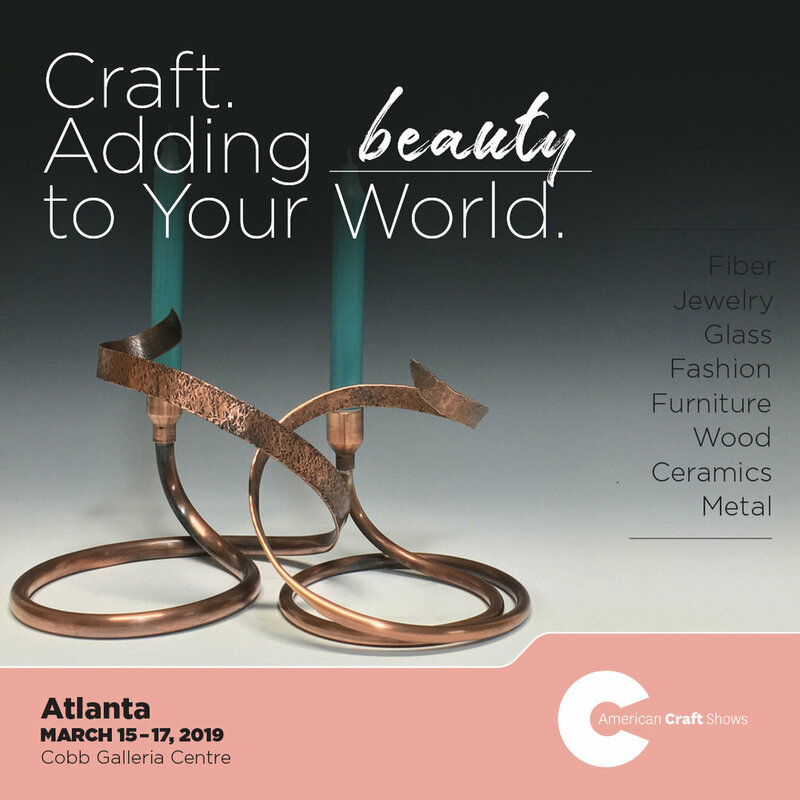 The artists at Craft + Design travel from all over the United States and regularly exhibit their work at the Smithsonian Craft Show, the Philadelphia Museum of Art Craft Show and the American Craft Council's shows in Atlanta, Baltimore, St. Paul and San Francisco. This year’s event will take place November 17-19, 2017. Main Street Station’s newly renovated train shed. At our three-day Carolina Artisan Craft Market, November 10-12, 2017 at the Raleigh Convention Center, attendees will shop from more than 110 contemporary fine craft artists who’ve traveled from across North Carolina and the U.S. to the heart of downtown Raleigh. Hand-crafted art, jewelry, and home goods. A one-of-a-kind shopping experience, for you and your one-of-a-kind friends. General admission show tickets and weekend passes will be available for purchase during show hours at the Lobby Box Office in front of Exhibit Hall C (facing W. Cabarrus St.) inside the Raleigh Convention Center. For answers to questions about the 2017 CDCG Carolina Artisan Craft Market please call (919) 460-1551. Our American Fine Craft Show has finally found a new home. I'll bring anvil, hammers and shear, and wrangle copper on site. It’s a show you won’t want to miss! CURRENT, Richmond’s contemporary art fair, is pleased to announce that the second edition of the fair will be held on the ground floor of the historic Main Street Station in the heart of downtown. This year, CURRENT will see the return of its inaugural exhibitors as well as a lineup of new exhibitors and cultural partners. CURRENT emphasizes accessible opportunities to collect art by local, national, and internationally recognized artists, and will feature artist talks, panel discussions, on-site screen printing, and more. CURRENT is free and open to the public on September 29 - October 1 at the Main Street Station in Richmond, Virginia. Check out my work at the GlavéKocen booth. For 52 years, Gallery at First UU has been home to an eclectic collection of regional fine art and craft. Join us on opening night, Wednesday, September 20 through Sunday, September 24 for an exciting 2017 show! I'll be going back to Indianapolis this spring! Along with visiting my daughter and friends made at last year’s show, I am joining one of the best shows in the region with over 270 artists from across the country. The butterfly is a rich symbol for change, diversity, and interdependence. Explore this walking meditation as part of your journey with nature in the wattle-woven copper and sapling walls of the Butterfly’s Journey. Declare (and write) an intention and weave it into the walls as you open to this new experience. Like quilting, gardening is often a piece by piece endeavor. We stitch together plants that have meaning for us, shared from a friend’s garden or collected from a plant sale, to wrap our homes in the beauty of nature. Arbor Quilt is an example of piecework in a garden setting. Using the Log Cabin quilt pattern, we will stitch together a vertical tapestry of plants and mosses in the main arbor walkway. These two installations are created by Richmond copper artisan Cathy G. Vaughn. Vaughn is a full-time artist and copper wrangler at her studio, Tracery 157, in Richmond, VA. An avid tinkerer, Vaughn taught herself the basics of working copper over two decades ago, and has been pushing the boundaries to reimagine and repurpose industrial-grade copper ever since. A native of rural South Carolina, she learned the makers' ethic in her fathers’ workshop. Vaughn has a BFA in graphic design from the University of South Carolina, is active in craft guilds from North Carolina to Pennsylvania, and is passionate about the intersection of science, art, and design.